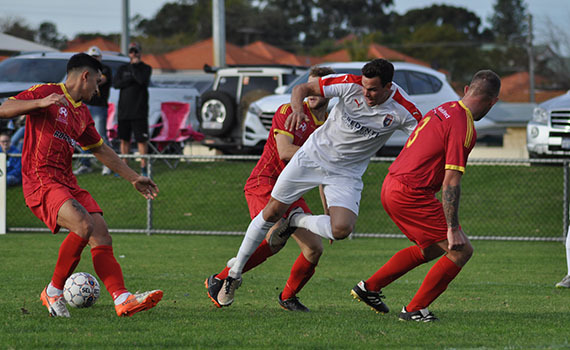 ECU Joondalup kept their NPLWA top four hopes alive after a 3-0 win against a nine-man Stirling Lions at Macedonia Park. Tommy Amphlett gave the Jacks the lead early before Dhuors Chol and Dean Cummings were sent off in the space of six minutes midway through the first half. A brace from Daryl Nicol after the break made sure of the points, and their first win at the ground since 2004, and it could have been more if not for Stirling keeper Lance Alavakis, who pulled off a number of fine saves. Click here to listen the Brad McDonald and Head coach Dale McCulloch’s post-match interviews. 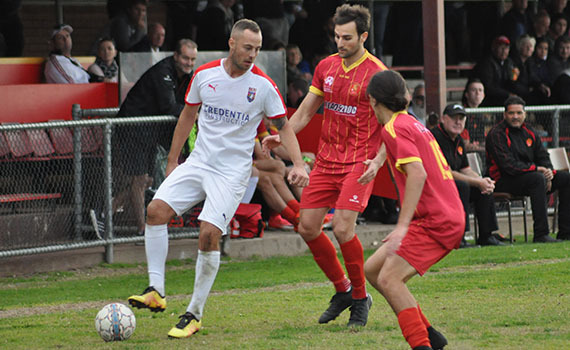 McCulloch made three changes to the side that lost against the Glory last week with Cian Hirrell and Shane Cassidy both suspended, and Cameron Murray unavailable. Adam Tong came in for Cassidy at the centre of the back four, Ross Millard into left side of midfield for Murray, while Tom Hough came into midfield with Brad McDonald going to right back in place of Hirrell. The Jacks knew a win was vital is they had any chance of catching the teams above them and they made the perfect start with a goal after only two minutes. 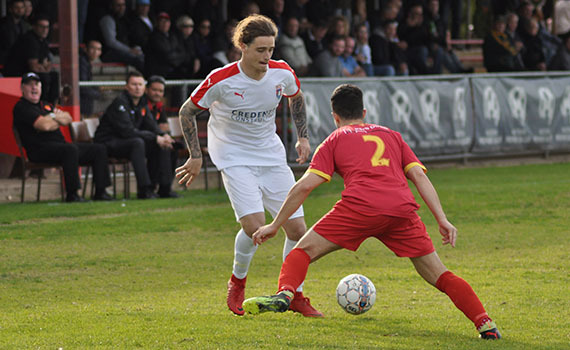 A long throw by Adam Tong was flicked on by Gordon Smith, and the ball fell to Amphlett, and the former Glory midfielder finished past Alavakis. It was almost two moments later, Nicol racing clear, but his shot on the run was well saved by the Lions custodian. Then on ten minutes we lost Millard, the midfielder limping off the pitch after a clumsy tackle, and he was replaced by Sam Pollard. The Lions settled and should have levelled on eight minutes, Steve Sokol was sent clear, but former Lions keeper Johnny Perkins stood tall to deny him. But the game took a twist on 26 minutes when Chol was shown a straight red card by referee Michal Jasinski after a lunging tackle on Nicol, and it went from bad to worse when Cummings followed him to the changing rooms six minutes later with a similar tackle on Amphlett. The Jacks continued to dominate and Gordon Smith saw a shot flash wide of the target, but the nine-men managed to hold on till half time, but they had Alavakis to thank, the keeper pulling of a string of fine saves, the best a stunning reaction save from a deflection from his skipper Darren O’Riordan on the stroke of half time. But five minutes into the second half the Jacks doubled their lead. Another Tong long-throw picked out Nicol at the front post, who lost his marker to score from close-range. The Jacks went close to a third on the hour, Sam Pollard played Nicol through, he cut inside his marker, his low shot beat Alavakis but crashed off the base of the post and way to safety. We were dominating and started to find holes in the Lions back line, but we couldn’t turn the chances into goals much to the frustration of the coaching staff. Alavakis was outstanding, he saved well to thwart McDonald, the rebound falling to Nicol, who spooned the ball over the top from close-range. Moments later Pollard’s shot was saved by Alavakis, but the keeper did even better s aving at full stretch from Lucas De Lima’s follow up shot. Nicol was causing all sorts of problems for the tiring Lions back line, he was in again on 67 minutes after he was sent clear by Hough, but Alavakis stood tall to deny him. He was involved again three minutes later, this time his pace took him clear, but he feed De Lima who’s shot was straight at Alavakis. The Lions went close themselves ten minutes later, when substitute Alex Tanevski was sent clear, he rounded the keeper, but Tong got back with a great last-ditch tackle to deny him. But despite squandering a number of chances the visitors wrapped up the points nine minutes from time. Brad McDonald picked out Nicol in the box, and he turned his marker and finished clinically past Alavakis for goal 17 for the season for the Scottish striker. At full time a good three points and our first win at Macedonia Park in 14 years, and we now prepare for a big game next Saturday against Inglewood United at the ECU Football Stadium. In other games against the Lions on the day, Derek Johnstone’s under 18’s drew 1-1, but were denied three points when a late goal was controversially disallowed. Mark Scanlan’s under 20’s maintained their lead at the top of the table with a hard fought 1-0 win. The only goal of the game came from Ben Hinshelwood’s cross and Ethan Brooks scored, but they had keeper Jack Nunn to thank, the big keeper making a crucial late save, when the Lions striker went one-on-one with him.